The economy is rapidly changing and the job market is evolving along with it. 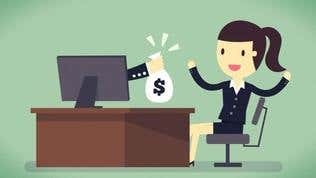 This is attributed to the fact that a new wave of freelance jobs have taken root, and it's becoming more and more viable as a means of earning extra income. It's no longer surprising to see a good number of full-time or permanent employees in a company having some sort of business on the side to boost their income. These, in most cases, are freelancing jobs like designing, journalism, writing, photography or any other form of service that can be done during off-hours. Freelance gigs can be quite lucrative, and have, in some cases, earned freelancers more than the salary from their regular jobs. And those who have experienced it usually start thinking about whether they should quit their jobs to focus more on their freelance gigs or not. It's not an easy decision to make, especially when the risks—such as stability, job security, breach of contract, or viability of the job—are considered. Whatever the case is, you have to remember that taking that vital step could possibly be just what you need to change your life. Planning ahead is the first step towards making your freelance job a permanent career. Try to focus on the things that you have to do if you decide to take this route, like knowing what kind of clients you have and the ones you are targeting, your competition, and whether you want to hire employees in the future. Draft some sort of detailed business plan that, among other things, includes the amount of money you need as initial capital. Once you've determined your needs, make the necessary arrangements. If you need to save up for capital, it might be a good idea to stay with your current job. Understanding your competition is a particularly important area. You have to understand exactly what they offer, so you can think of what you can provide that they don’t. Always think of offering something that's unique to make your business stand out. It doesn’t have to be huge, but if you can think of something that will get you return clients and more referrals, that's a big deal. Before making that final leap into full-time freelancing, you should make sure that you have a detailed and specific description of the services you provide. For example, if you started out as a freelance writer, it would be a good idea to let clients know exactly what kind of writing you specialize in. Is it Academic Writing, Technical Writing, or providing Web content? You will need to establish your specific skill set to reach a more targeted market. If you are going to leave your current job to be a full-time freelancer, you might as well give it your best shot to improve your chances of thriving in an unstable market. This can be done in several ways. For example, you can go the extra mile by exceeding the expectations of your clients. Deliver your projects earlier than the stipulated deadlines, or offer to work extra hours. You can also provide extra services like corrections, record keeping, and compiling, free of charge. You should also put some effort into marketing your services through networking and creating a blog or website that explains your services. If you're planning to do this, make sure that you prominently show your contacts and rates on the pages so potential clients will know how to reach you.